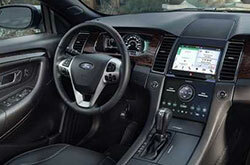 The Ford Taurus is an accomplished member of the full-size sedan class. It boasts ample storage and passenger spaces, a wide list of features, powerful powertrains, and an attractive price range. Apart from chucking the 2.0-liter EcoBoost engine from the lineup and restructuring the Equipment Group 201A, the Ford Taurus continues almost unchanged for 2018. 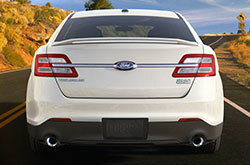 The full-size Ford Taurus is available in four trim levels: the base SE, the SEL, the Limited, and the SHO. The entry-level SE provides 18-inch alloy wheels, a driver information display, an exterior keyless-access keypad, power-adjustable front seats, and automatic headlights. On the tech front, it receives Sync voice controls, a rearview camera, a six-speaker sound system, a 4.2-inch central display, two USB ports, Bluetooth connectivity, and a CD player. Moving up to the next-level SEL adds several items to the SE's standard features including body-color heated mirrors, rear parking sensors, LED daytime running lights, dual-zone automatic climate control, remote engine start, upgraded cloth upholstery, and puddle lamps. A leather-upholstered steering wheel and shift knob, satellite radio, and an auto-dimming rear-view mirror are also standard on the SEL. 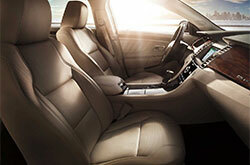 Heated front seats and full leather upholstery are available as stand-alone options. The SEL's Equipment Group 201A options package further adds an additional center speaker, keyless entry and ignition, an 8-inch touchscreen with the Sync 3 function, and smartphone integration. The Taurus Limited ups the ante with all the above equipment plus 19-inch alloy wheels, automatic wipers, power-adjustable pedals, leather upholstery, automatic high-beam control, 10-way power front seats with heating and ventilation, and an auto-dimming driver-side mirror. The driver's seat gets memory settings and the second-row seats include a heating system on the Limited trim. Furthermore, the trim benefits from ambient interior lighting, a premium Sony audio system, a power-adjustable steering wheel with heating, and HD radio. Stand-alone options available to both the SEL and Limited trims comprise of 20-inch alloy wheels, a navigation system, a sunroof, and a rear spoiler. 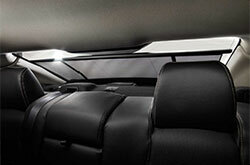 A Driver Assist package is available to the Limited trim, the contents of which are discussed in the Safety segment. The sporty, high-performance SHO trim adds a bigger engine, a sport-tuned suspension, xenon headlights, a rear spoiler, a black exterior trim, unique leather upholstery, special 20-inch wheels, a unique interior trim, dual exhaust tips, and paddle shifters. The SHO comes standard with most of the Limited's options. The top-tier trim also has access to an available SHO Performance package with summer performance tires, upgraded brake pads, a revised acceleration-quickening final-drive ratio, an enhanced stability control function, special steering tuning, stiffer suspension tuning, simulated suede-upholstery on the steering wheel, and a Track mode. A 3.5-liter V6 engine worth 288 hp and 254 lb-ft of torque motivates the first three trims. EPA estimates that the engine returns 17/24 mpg with AWD and 18/27 with FWD. The performance-oriented SHO model comes with a more potent 3.5-liter twin-turbo V6 that cranks out 365 hp and 350 lb-ft of torque. The engine ranks at 16/24 mpg with the standard AWD. A six-speed automatic is the only transmission. The 2018 Taurus carrying the lesser V6 engine makes a zero to 60 mph run in just 7.2 seconds, a respectable time for a vehicle of its size. It also stops from 60 mph in an impressive 120 feet. The NHTSA gave the 2018 Ford Taurus its top five-star rating for overall protection. The model also earned the IIHS' highest-possible score of "Good" in four crash tests. It also received the independent regulator's second-highest "Acceptable" score in the small overlap front crash test. The available Driver Assist package installs Collision Warning with Brake Support, Active Park Assist, adaptive cruise control, Lane Departure Warning, and Lane Keep Assist. Other safety equipment includes blind-spot monitoring, automatic high beams, Cross-traffic Alert, rear parking sensors, and an SOS post-crash alert system.